Patio umbrella lights keep the party going even after the sun goes down. Outdoor umbrella lights provide a warm glow for a romantic dinner or bright lights for late night card games. They keep the party going even after the sun goes down. Why just enjoy your patio during the day? This patio umbrella accessory adds so much to any evening by the pool that no patio umbrella should be without one. Lighted patio umbrellas provide the perfect ambiance for an evening outside - and you have some great options to choose from. Power sources can be battery operated, solar, electric or candles. Decide first what is the purpose of the light - is it just for ambience or do you want to be playing a game or cards at the patio table. Then decide what power sources works best for you. Solar, battery and candles can be used in combination - hanging from your umbrella ribs, umbrella pole and on the table. If we can sit outside comfortably in the evening, we'd rather by outside than inside enjoying the evening breeze, the stars and possibly a full moon. You can count on the sun going down every night, so instead of moving inside or having your guests go home, be prepared with some type of patio umbrella light. With limited space on the patio table we like to use lights that use the pole rather than sit on the table. An outdoor umbrella candle offers elegance and simplicity. This candelabra provides a beautifully lit table for evening entertaining out by the pool - without taking up any table room. I have owned one of these for years, and it is one of my favorite patio umbrella lights. Entertaining in the evening means no hot sun, cooler temperatures, and a great mood with the stars out and some candles. Simply light your candles and you have a beautiful centerpiece and light. The space saving light fits around almost any size patio umbrella pole. Most of these candles are metal. This one comes with 6 glass votive holders and uses votive candles. Our outdoor patio table only seats 4 and after the table has been set and the food put out, there isn't much room left for a centerpiece and candles. 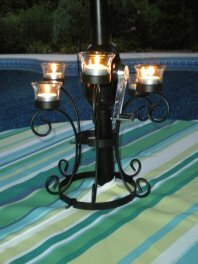 The candle holder provides the perfect outdoor lighting for evening entertaining and the glass votives protect the candles from blowing out in a breeze. You can use tiny electric candles in them as well. Lighted patio umbrellas keep the party going after the sun goes down. Simply clamp the light to the pole and adjust the amount of light by putting it low and closer to the table for more light or higher up the pole for less light. If you want to combine it with candles, flip it or reverse it so that the light shines up into the umbrella and then have the warm ambient lighting candles underneath. This less expensive umbrella light offers plenty of light to keep the party outside. The one I purchased has 40 LED lights and it is plenty of light. It fits nice and snug around the umbrella pole. It's very easy to clamp on and release. We have left ours out in the rain under the Sunbrella fabric umbrella many times - and it still works - but I wouldn't recommend it. 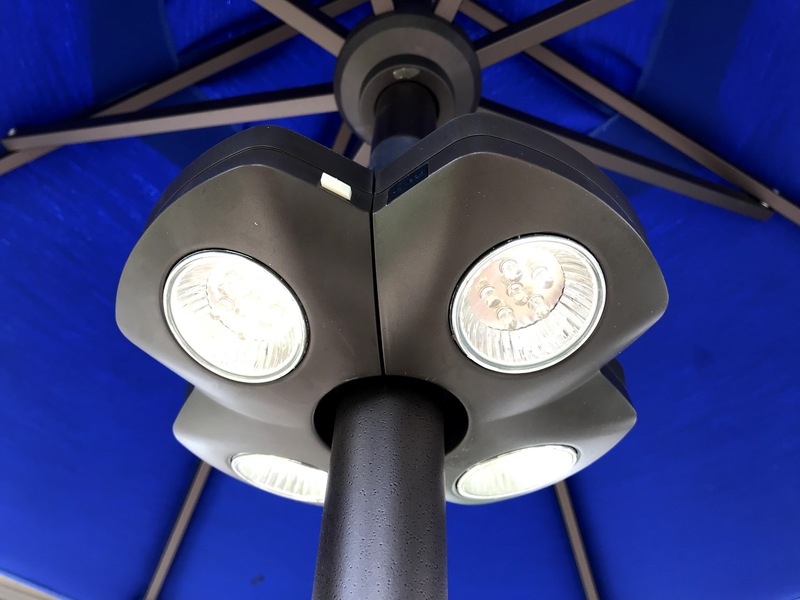 These battery operated umbrella lights provide direct lighting so you can see well enough to simply dine at your patio table or play cards and games. The 40 LED lights provide up to 30,000 hours of use. It uses 6 standard AA batteries (not included). Brand new batteries can provide up to 30 hours of illumination. We have used ours for several hours for many evenings without having to change the batteries. These lights make a big impact with little effort. The set up is super easy - just attach the solar panel to the top of the umbrella and voila - lights come on automatically every night. This 9' umbrella is made out of powder coated steel ribs with an aluminum pole. It has my favorite features - a crank to open the umbrella and a tilt mechanism to block the sun. The more LED lights the better. With 5 LED lights on each rib for a total of 40 lights, in full sun the solar lights will glow for 9-12 hours. The solar panel/battery is located on top of the umbrella. Solar outdoor lights are a simple, inexpensive, yet effective way to light up your pool or patio area. We use a combination of solar umbrella lights, solar torches, and solar string lights. We love how they just come on effortlessly and reliably every evening. No need to go get batteries, find an electric outlet or light up candles or torches. Umbrella solar lights offer the easiest way to bring light to your patio table. Solar lights means there are no cords or batteries, they are powered by the sun. So simple - they come on automatically each night as the sun goes down. Clip them onto the edge of the umbrella and you have some colorful, pool party lights. My battery operated paper lanterns have all been replaced with nylon lanterns that don't mind mist, humidity or rain. They are so much more durable and will last you season after season. Outdoor nylon lanterns like these provide color and light. Our guests loved them as we sat late into the evening out by the pool under the patio umbrella. Several neighbors came by on the golf cart path that goes behind our house and all of them wanted to know where we had bought them. What makes them great is that they are solar powered and can be kept outside. No running around to turn on lights or finding batteries. I like that these are 12" lanterns - not 10" - and when it comes to outside you want bigger. Hang battery operated paper lanterns from the ribs of your outdoor umbrella. Use an assortment of colors or just use the theme colors from your party. You can purchase the paper lanterns individually or several in a package. These took AAA batteries and they lasted for several hours for a couple of evenings - so keep extra batteries on hand. Colored paper lanterns look great during the day and night. Just turn on a little switch when it starts to get dark. Battery operated lights give you the flexibility to put the lights wherever you want to - and because they have a nice flat base you can use them on your tables as well. Paper lantern lights can offer lots of variety in style, color and size. White paper lanterns offer a soft and sophisticated look while bold and brightly colored party lanterns add a more festive feel. Patterns and fun shapes like beach balls add a splashes of color and light. Where should you put your hanging paper lanterns? You can see that these colored paper lanterns came with hooks (and also light up with batteries). The hooks make it very simple to hang (not all paper lanterns have these). 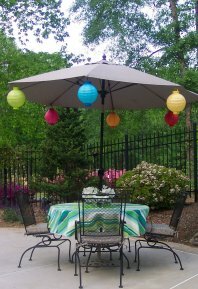 You can hang your colored paper lanterns from tree branches, on a string strung across your food table, from shepherd hooks in the ground, or on the ribs of your outdoor umbrella. What I love about these battery operated paper lanterns is that you can find them in just about any theme - pumpkin ones for fall or Halloween parties, red and white ones for Christmas, Easter egg ones for Easter and beach ball ones for beach parties. We hosted an evening fall party and hung the lighted pumpkins on the tree branches and on vines growing on our arbor to greet the guests when they first arrived. 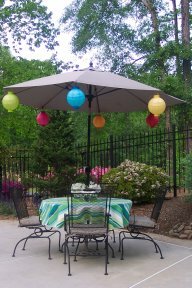 Take these patio umbrella lights in when the party is over as they are paper and won't hold up in any rain or mist. Outdoor umbrella lights allow us to entertain guests or enjoy an evening by the pool by ourselves long after the sun goes down. If you have a patio umbrella, then an outdoor umbrella light is an inexpensive way to spend more time in the beautiful outdoors. Enjoy your evenings by the pool with a lighted patio umbrella. Enjoy every last minute of the day or shall I say night, by lighting up your patio umbrella.